The development of new L.E.D (light emitting diode) technology from Narva is set to open up a new era in industrial and agricultural lighting. An all new L.E.D work lamp, delivering an amazing volume of light (500 lumens) and creating whiter light, has just been released by Narva. With no globe filament to break, reliability and service life of the new L.E.D work lamp is dramatically greater than traditional halogen alternatives. When combined with die-cast aluminium housings, stainless steel fittings and virtually unbreakable polycarbonate lenses, the new lamp from Narva is designed for harsh working environments. 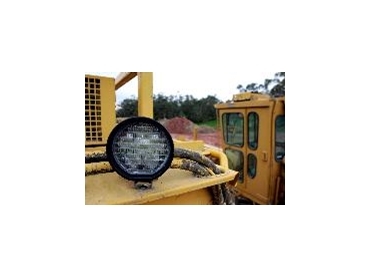 An additional advantage with the new Narva LED work lamp is the low current draw of just 1.2 amps at 12 volt and 0.5 amps at 24 volt, placing little or no strain on the electrical system of the operating vehicle. The lamp will even perform at full brightness as low as 8.5volts and over-voltage protection is also provided. Light in weight, fully adjustable and with dimensions of just 106mm diameter and a depth of 63mm, the LED work lamp fitting is easy in a multitude of applications.